So, every "story line" is about a Journey? IN Angel and Demons, we follow the story of Professor Robert Langdon. So in relation, I pointed out that Dan's Brown's book which I read, and the film I have yet to see has it's differences, while we see the transfer from one medium to the next. Same storyline. Pirsig's touch with the recognition of the Chautauquas, "the traveling tent-show Chautauquas that used to move across America, this America, the one that we are now in, an old-time series of popular talks intended to edify and entertain, improve the mind and bring culture and enlightenment to the ears and thoughts of the hearer." Anyway, I presented the Dialogues of Plato and the Plays of William Shakespeare as forums in which characters real or imagined, help to move forward the reader under "ideological progressions," as if, dealing with this inductive/ deductive realization of information and probable outcomes once given the scenarios which are displayed for the mind to entertain. Earlier in this thread I had mentioned Robert Pirsig and it is here as well I mention, "The Beautiful Mind." Both situations here are recognition of the Demons both indivudals(John Forbes Nash) under go, as their story written is told in a life lesson and in John Nashes case, a film. Must we recognize that genius courts closely the aberrations of a sane and inquisitive mind, who looses touch with reality. Not so different then, when one who holds to this "other agenda of the Illuminati" in the Angel here Demons story here? So who was Robert Pirsig's Demon(Daemon)? If one has the chance to read Robert Pirsig's book Zen and the Art of Motorcycle Maintenance , one should most certainly do so. I had seen this book lying around over the years and never really gave it much notice until a gentlemen spoke to me about the issue of "Quality and the Good." Being a reader of Plato and seeing this influence in science today, I was after something quite substantial as I look to see how ideas could enter the mind, and that in general, not to conceive of it as an portend of evil( that Daemon), but as an acquisition of the inquiring mind of the student to reveal "a higher wisdom" resides in each of us. This was part of setting the stage if you might, to recognizing this "dual nature," as an inductive/deductive relation we use in our relationship with the world. So in this sense, a scientific position and responsibility of becoming an open person to receive information, as you delve ever deeper into the nature of things. I am not saying this is the way it is, just that it is a "point of view" I was able to gather, once one does their own homework. Pays attention to the politics. What is "self evident?" So indeed Noise presents a "climatic realization of assumption after assumption." In the real world, we are only armed with what we are expose too? Is this not the way it seems? Why such medium exposure might be thought of, as to the "way the world is according too," which point of view. You have to be given the power back for discernment of what it means to you and ever the role of a scientific mind as to inquiry, for being responsible. It is important to know then that Robert Pirsig's Angel or Daemon, was Phaedrus( depends on how you look at it in terms of what was given to Pirsig). As real or imagined the story line in the Journey across America with his son, was the realization of the lost years in an identity that went on a excursion, and never came home until the breakdown. John Nash had his own characters in the film, discovered later on, were the imaginings of a mind, lost in the battle of what is real with paranoid schizophrenia. For John Nash it was always then later on in dealing with reality the struggle of who John Nash was while facing these imaginary people. So while I say "real or imagined" one understands fully here that while we had identified the use of characters under the notion of "creative writing of Plato or of Bacon's Shakespeare," it was apparent that in the cases that I have sighted of Robert Pirsig and John Nash, that while sick mentally, genius and brilliance were courted. While I would point to John Nashes mathematical astuteness while sick, I am more wanting to point out the "Quality and the Good" of Pirsig as I continue. This is an understanding of that finer attribute of theoretical thinking that we ventured too. To see if reality by experimentation thusly engendered, then qualifies. How indeed did progression be marked if it did not allow one to see anew, with a new perspective and experiments are validated. In sociological thinking of our everyday, how did our assumptions prove we were thinking theoretically, while assessing the politico defalcates of position and inherent of a party? What is the basis of this discernment then we can discriminate the truth of applied rights of constitutions written for democracies were written for freedoms and rights? I think there is indeed a change taking place in the way we look at things and scientifically this shift holds perspective about WMAP in ways that one is not accustomed? Part of my thinking is the dynamical realization of of the space we live in, and how the depth of it is slowly being realized. That's just my opinion though. Modern cosmology has sharpened questions posed for millennia about the origin of our cosmic habitat. The age-old questions have been transformed into two pressing issues primed for attack in the coming decade: How did the Universe begin? and What physical laws govern the Universe at the highest energies? 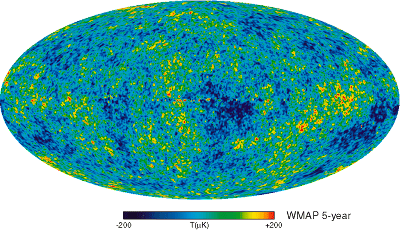 The clearest window onto these questions is the pattern of polarization in the Cosmic Microwave Background (CMB), which is uniquely sensitive to primordial gravity waves. A detection of the special pattern produced by gravity waves would be not only an unprecedented discovery, but also a direct probe of physics at the earliest observable instants of our Universe. Experiments which map CMB polarization over the coming decade will lead us on our first steps toward answering these age-old questions. I wanted to continue with the Angel and Demons part with regard to the Fresco at the Vatican by Raphael. It is more about what is revealed, just as this counter culture revealed a course set out by the idea of the Illuminati using Bernini. It is more about our interaction with the world and how we can escape this dualistic pace we operate from, to become more intuitive about our dealings with the world and how discovering this part of truth within our own selves will allow us to discriminate what is coming at us. A basis if you might. Thanks for the article. contains Raphael's most famous frescoes. Besides being the first work executed by the great artist in the Vatican they mark the beginning of the high Renaissance. The room takes its name from the highest court of the Holy See, the "Segnatura Gratiae et Iustitiae", which was presided over by the pontiff and used to meet in this room around the middle of the 16th century. Originally the room was used by Julius II (pontiff from 1503 to 1513) as a library and private office. The iconographic programme of the frescoes, which were painted between 1508 and 1511, is related to this function. The Raphael Rooms (also called the Raphael Stanze) in the Palace of the Vatican are papal apartments with frescoes painted by Italian artist Raphael. The Rooms were originally intended as a suite of apartments for Pope Julius II. He commissioned the relatively young artist Raffaello Sanzio and his studio in 1508 or 1509 to repaint the existing interiors of the rooms entirely. It was possibly Julius' intent to outshine the apartments of his predecessor (and rival) Pope Alexander VI as the Raphael Rooms are directly above Alexander's Borgia Apartment. Raphael's Fresco of the School of Athens immortalized the idea of the Aristotelean Arch. Thus this was an image much as shown in Bernini's use that we can define something about the way in which we can perceive the world and gather perspective accordingly. We need to be well equipped these days to discern the differences of what is coming at us. I am retracing my steps in terms of the idea of this counter culture in the movie called the Illuminati, was a not so strange idea when we spoke of the idea of Plato writing his own dialogues and speaking as if a number of people, as was Shakespeare, and his real identity as that of Sir Francis Bacon, which I have elucidated in the post. So confined by their own perspectives, that they thought to speak as wide a possible and as free as possible without the constraints of? You see? Speculation of course. yet a method established to serve as being the ruler of truth. He suggested this as being what he contended to be his scientific method, which he called the inductive method which where the gathering of observational evidence of the world to be then deduced as to decide. So most certainly describing the constraints as defined in your wording to think outside the box. So this brings us back too, the Aristotelian arche. If we continue to give reasons for reasons, from Z to Y, to X, to W, to V, to U, this is called the Regress of Reasons. Aristotle's second point was just that the regress of reasons cannot be an infinite regress. If there is no end to our reasons for reasons, then nothing would ever be proven. We would just get tired of giving reasons, with nothing established any more securely than when we started. If there is to be no infinite regress, Aristotle realized, there must be propositions that do not need, for whatever reason, to be proven. European aristocrats transferred their lighted candles from Christian altars to Masonic lodges. The flame of occult alchemists, which had promised to turn dross into gold, reappeared at the center of new "circles" seeking to recreate a golden age: Bavarian Illuminists conspiring against the Jesuits, French Philadelphians against Napoleon, Italian charcoal burners against the Hapsburgs. This to me set up an ultimate logic to perspective that had to rise above an inductive/deductive approach to reveal that thinking could establish a "principle in science" that would not have taken much to realize discovering the profound implication it could have with our everyday world. To find it imbued with such simplicity, one would wonder why it never occurred to someone else before. This is a foundation issue then that goes on in science. As with, Symmetry? But there is something that science does not like, that we might not have known had we not realized that a scientist like Newton had his own inclusion in the process, to have us think there was something much more to this process of the gold making. To mean something much more. Then, the principal of wo/men who had wisdom, then sought after gold, were not to profit monetarily by? The Republic: "You must contrive for your future rulers another and a better life than that of a ruler and then you may have a well-ordered State; for only in the State which offers this will they rule who are truly rich not in silver and gold but in virtue and wisdom which are the true blessings of life." So indeed, you speak to this Christian historical occupation of the transference to the Masonic principals, I would like to think, that if wo/men could provide us with the inherent simplicity of an "equatorial design" to prepare us for traditional thinking in the world. I would not like to think they were absent of the understanding of this "metaphorical relation to the human being perfecting themself emotively" to produce that wisdom or silver. This is to awaken "an ideal here" about the progression of the chemistry in the human being "to thinking correctly" about the way we would want to engage life. Not some religion as it would have appeared in the struggle between the Illuminati and the Catholic Church, as was portrayed in Angels and Demons. Wonder storyline and research to support, but far from the thinking I think predominates those who strive to get to the basis of simplicity to also think about what transpires in our social activities of babble, while caught in a this dualistic nature of perspective arising from the background of the privilege or not so privileged. So while there is scientific validation, as to what shall progress, I do not like to think that the Masonic lodges were the ones to hold this principal of the work to provide for this perfecting of the human being? This was confined to individual who developed their labs to experiment and provide for, the stunning simplicity of truth, about discovering of experiment in distilliation and what it provides for. Psychologically, this is easily given in societal interactions and by awareness on our upbringing. This a matter of principal in Condense Matter Theorist point of view with regard to Robert Laughlin. Theoretical physics, in string theory would like to think that it understands Laughlins point of view , and with it spacetime to emerges as well from that foundational perspective. Others, renounce this symmetrical point of view as a "foundation basis" as well? Robert Betts Laughlin (born November 1, 1950) is a professor of Physics and Applied Physics at Stanford University who, together with Horst L. Störmer and Daniel C. Tsui, was awarded the 1998 Nobel Prize in physics for his explanation of the fractional quantum Hall effect. Laughlin was born in Visalia, California. He earned a B.A. in Physics from UC Berkeley in 1972, and his Ph.D. in physics in 1979 at MIT, Cambridge, Massachusetts, USA. In the period of 2004-2006 he served as the president of KAIST in Daejeon, South Korea. First Three minutes of Steve Weinberg or the First three seconds and we see where perspective was drawn as one delves deeper into reductionism as to the idea of the Universe when it first came into being. Physicists have always argued about which kind of law is more important - fundamental or emergent - but they should stop. The evidence is mounting that ALL physical law is emergent, notably and especially behavior associated with the quantum mechanics of the vacuum. This observation has profound implications for those of us concerned about the future of science. We live not at the end of discovery but at the end of Reductionism, a time in which the false ideology of the human mastery of all things through microscopics is being swept away by events and reason. This is not to say that microscopic law is wrong or has no purpose, but only that it is rendered irrelevant in many circumstances by its children and its children's children, the higher organizational laws of the world. Aristotles' definition appeared after Plato. Plato, meant somethng different? Jas:Searle affirms that "where consciousness is concerned, the appearance is the reality". His view that the epistemic and ontological senses of objective/subjective are cleanly separable is crucial to his self-proclaimed biological naturalism. On a subtle level this can have philosophical origins, while working toward a larger audience. It resides in our own personal interactions that I would like to think by, "finding a basis of relationship" would advance the understanding for each individual toward a recognition of the "truth monitoring" that we have become "sleeping somberly with," would focus on the issue of being desensitized by that "information overload?" Thanks:acknowledging all that is within myself- a most difficult task, but grounding. This sounds like a quote to me. :) Most obvious, of course. It does say a lot. Because we are in a sense are like Plato and Aristotle in the center of this picture. Yet, while one can contend that Plato's view is airy and in belief so, "with finger pointing up," that such ideas can be transmitted to what had been scientifically challenged, information gathered, and experimental processes delivered( Aristotle hand showing all that is"), is like "taking a fork in the road," while still acknowledging that ideas can be transcendent. To be grounded, is a philosophical challenge? Intuitive leap how airy indeed? So how is it that such a challenge could not have been contained too, "acknowledging all that is within myself," while intuitively making the leap and say you were still responsible and had made a judgement, moved on to consider that simplicity by dissection, revealed something new....."a most difficult task, but grounding?" So this becomes a interaction with the world in a sense, that the interior and exterior world, become intertwined with your participation. This is a dynamical relation then that the views of Plato and Aristotle draw us toward that "center of the picture." Raphael reveals something about them as if Raphael would like to portray? So in this sense Angel and Demons use by the author while thinking to incorporate Bernini in this hidden language, so it is by artistic intent, that information is presented in the Fresco to consider the context of historical participation in the School of Athens. 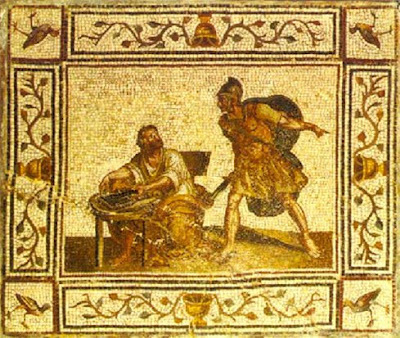 For Plato then it was the ideal city-state of Kallipolis, and for Bacon, an idealized city/state? The Philosopher KingPlato defined a philosopher firstly as its eponymous occupation – wisdom-lover. He then distinguishes between one who loves true knowledge as opposed to simple sights or education by saying that a philosopher is the only man who has access to Forms – the archetypal entities that exist behind all representations of the form (such as Beauty itself as opposed to any one particular instance of beauty). It is next and in support of the idea that philosophers are the best rulers that Plato fashions the ship of state metaphor, one of his most often cited ideas (along with his allegory of the cave). "[A] true pilot must of necessity pay attention to the seasons, the heavens, the stars, the winds, and everything proper to the craft if he is really to rule a ship" (The Republic, 6.488d). Plato claims that the sailors (i.e., the people of the city-state over whom the philosopher is the potential ruler) ignore the philosopher's "idle stargazing" because they have never encountered a true philosopher before. Noise:I find myself at odds with this point and I was wondering if you guys are aware of any contrary opinions to this...it is an infinite regress and all proven knowledge is based on assumptions/reasons that have yet to be reasoned (all proof is based on unproven assumptions). I think the term might be included as "Self-Evident." This does not mean you discard the critical analysis for which science ask you to be responsible. You gather information. You look at the theoretics. You look at experiments. This paves the way for new processes to be considered. Benjamin Franklin thought to question Thomas Jefferson penned version, because of it's applicability to all people. Driven then, by the necessity of deduction it was well aparent that such a wording of drafting a constitution would then fall under such scrutiny. Driven too, what is self evident? Constitutions in general set out the conduct becoming and rights. Alain Connes-Where a dictionary proceeds in a circular manner, defining a word by reference to another, the basic concepts of mathematics are infinitely closer to an indecomposable element", a kind of elementary particle" of thought with a minimal amount of ambiguity in their definition. Not only in scientific process do we see where this works, but to the basis of a social and democratic understanding about the rights under the drafting of any consitution. This is a fundamental recognition of what we have to face in our own analysis of the way the world is operating around us. The work that goes into dealing with the "inherent insights" we take from information we gather in media, television, and the internet. Now, what has it done to this "discerning principle" that resides in each of us. Desensitized, we let society go on with itself. We let politics, go it's way and "sleeping people" never know. They just vote, a party. I tend to disagree that dualism is a false construct. No doubt a struggle to identify this process even within our own situation that we are locked on this wheel of life and one wonders how can one rise above it? Sure and most certainly, philosophical thoughts about life. Sir Francis Bacon-Francis Bacon, 1st Viscount St Alban KC (22 January 1561 – 9 April 1626), son of Nicholas Bacon by his second wife Anne (Cooke) Bacon, was an English philosopher, statesman, scientist, lawyer, jurist, and author. He served both as Attorney General and Lord Chancellor of England. Although his political career ended in disgrace, he remained extremely influential through his works, especially as philosophical advocate and practitioner of the scientific revolution. Indeed, his dedication may have brought him into a rare historical group of scientists who were killed by their own experiments. His most celebrated works include The New Atlantis. Whether it's true or not some politicians become unhappy with the current state of things and dream of a better state. Dream about an ideal society. So they may adopt this new persona to drive home all those things that are not acceptable and write artistically about the new vison in poetic merit. A shakespearean perhaps? So it as a double life. In 1623 Bacon expressed his aspirations and ideals in The New Atlantis. Released in 1627, this was his creation of an ideal land where "generosity and enlightenment, dignity and splendor, piety and public spirit" were the commonly held qualities of the inhabitants of Bensalem. In this work, he portrayed a vision of the future of human discovery and knowledge. The plan and organization of his ideal college, "Solomon's House", envisioned the modern research university in both applied and pure science. Bacon's dream here is very familiar to most researchers as one looks to Plato's dialogues. Like Shakespeare, the dialogues were scenes set by Plato himself, and in such a state, the Atlantis "was a vision" he himself had. Some might dispute my charcterization of Plato, but I am sure that Bacon realized the way he might work, dealing with his unhappiness and charges against him, while then following the logic of what I am saying about Plato. In Angel and Demons, while it is The Roman catholic church, there is this other culture that rides along side of it, that was to become the bankers of the world placed in positions of trust, to lead society along it's agenda. Instead of, the one lead by the Roman Catholic church. So this leads one to think "about presentation and the technologies we currently have" and what happened in the "frescoes of the Vatican in Rome" that we might garner from it, a medium of expression. These then were to become thoughts about the measure of artistic impressionism. Let's say by Raphael? My pick. This was used in the film while thinking about Raphael first, it was the sculpture and works of Gian Lorenzo Bernini that tantalized langdons work to point the way for this counter culture to reveal its destiny in face of that same Roman Catholic tradition. 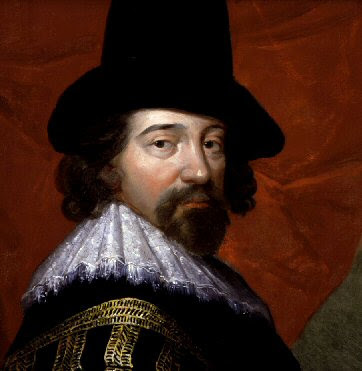 Francis Bacon (1561 - 1626)-----Rhetoricalthough not a rhetorician, contributed to the field in his writings. One of the concerns of the age was to find a suitable style for the discussion of scientific topics, which needed above all a clear exposition of facts and arguments, rather than the ornate style favored at the time. Bacon in his The Advancement of Learning criticized those who are preoccupied with style rather than "the weight of matter, worth of subject, soundness of argument, life of invention, or depth of judgment." On matters of style, he proposed that the style conform to the subject matter and to the audience, that simple words be employed whenever possible, and that the style should be agreeable. So why would Bacon, if he knew to present the thoughts of the day by scientific measure, thought himself to expose, only the other side of this thinking with artistic merit? Of course I am making the connection between William Shakespeare and Sir Francis Bacon. This could all be for naught while one digests the thinking here, about the way one lives, and the world that could exist, if only....? Word play is a literary technique in which the nature of the words used themselves become part of the subject of the work. Puns, obscure words and meanings, clever rhetorical excursions, oddly formed sentences, and telling character names are common examples of word play. All writers engage in word play to some extent, but certain writers are particularly adept or committed to word play. Shakespeare was a noted punster. James Joyce, whose Ulysses, and even more so, his Finnegans Wake, are filled with brilliant writing and brilliant word play is another noted word-player. For example, Joyce's phrase "they were yung and easily freudened" clearly conveys the meaning "young and easily frightened", but it also makes puns on the names of two famous psychoanalysts, Jung and Freud. One of the issues that is evoked by any faster-than-light transport is time paradoxes: causality violations and implications of time travel. As if the faster than light issue wasn’t tough enough, it is possible to construct elaborate scenarios where faster-than-light travel results in time travel. 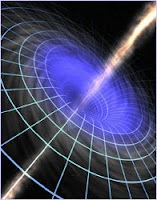 Time travel is considered far more impossible than light travel. I mean sure how is it one can measure time in energy particulate views when it appears all smeared out? It is the collision process itself and what I see in nature as Cascading particles as microscopic blackholes created and then quickly dissipated as decay in those particle showers. Seeing muon detections that tunnel, and find their way across the globe is something that is interesting, as we can now use them in measure, as to what passes through to what is fabricated there in the LHC, becomes an interesting new tool of climate change or even gravitational inclination in relativistic approaches. Length contractions is a key word here in microscopic measure. Dr. Maldacena and Dr. Polchinski each gave brief lectures related to their work. Both included broad overviews of string theory basics, with Dr. Polchinski noting the importance of "thought experiments" to help physicists make advances in the field. He said that physicists are excited about future experiments using particle accelerators such as the Large Hadron Collider at CERN, where some of these "thought experiments" could be validated. Dr. Maldacena, who was born in Buenos Aires, also spoke about ICTP's important influence on physics in Argentina, noting that many of his professors had spent time at the Centre. Dr. Maldacena himself has participated in ICTP training programmes and was a director of the Spring School on String Theory for four years. 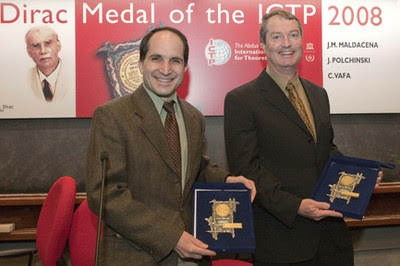 Professors Maldacena, Polchinski and Vafa are being honored for their fundamental contributions to superstring theory. Their studies range from early work on orbifold compactifications, physics and mathematics of mirror symmetry, D-branes and black hole physics, as well as gauge theory-gravity correspondence. Their contributions in uncovering the strong-weak dualities between seemingly different string theories have enabled us to learn about regimes of quantum field theory which are not accessible to perturbative analysis. These profound achievements have helped us to address outstanding questions like confinement of quarks and QCD mass spectrum from a new perspective and have found applications in practical calculations in the fluid dynamics of quark gluon plasma. Another deep quantum mystery for which physicists have no answer has to do with "tunneling" -- the bizarre ability of particles to sometimes penetrate impenetrable barriers. This effect is not only well demonstrated; it is the basis of tunnel diodes and similar devices vital to modern electronic systems. Tunneling is based on the fact that quantum theory is statistical in nature and deals with probabilities rather than specific predictions; there is no way to know in advance when a single radioactive atom will decay, for example. The probabilistic nature of quantum events means that if a stream of particles encounters an obstacle, most of the particles will be stopped in their tracks but a few, conveyed by probability alone, will magically appear on the other side of the barrier. The process is called "tunneling," although the word in itself explains nothing. Chiao's group at Berkeley, Dr. Aephraim M. Steinberg at the University of Toronto and others are investigating the strange properties of tunneling, which was one of the subjects explored last month by scientists attending the Nobel Symposium on quantum physics in Sweden. "We find," Chiao said, "that a barrier placed in the path of a tunnelling particle does not slow it down. In fact, we detect particles on the other side of the barrier that have made the trip in less time than it would take the particle to traverse an equal distance without a barrier -- in other words, the tunnelling speed apparently greatly exceeds the speed of light. Moreover, if you increase the thickness of the barrier the tunnelling speed increases, as high as you please. You and I know it as a time machine. Physicists, on the other hand, call it a "closed timelike curve." Below, feast on the concepts and conjectures, the dialects and definitions that physicists rely on when musing about the possibility of time travel. If this list only whets your appetite for more, we recommend you have a gander at the book from which we excerpted this glossary: Black Holes and Time Warps: Einstein's Outrageous Legacy, by Kip S. Thorne (Norton, 1994). The Economic Crisis and its Implications for The Science of Economics. Concerns over the current financial situation are giving rise to a need to evaluate the very mathematics that underpins economics as a predictive and descriptive science. A growing desire to examine economics through the lens of diverse scientific methodologies - including physics and complex systems - is making way to a meeting of leading economists and theorists of finance together with physicists, mathematicians, biologists and computer scientists in an effort to evaluate current theories of markets and identify key issues that can motivate new directions for research. 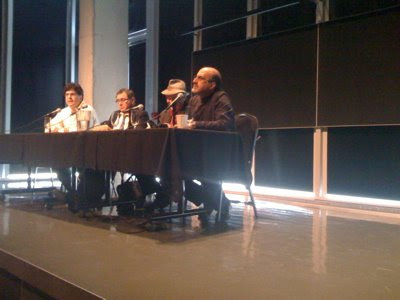 Perimeter Institute was suggested to be the gathering point and conference organizers plan to foster a very careful, dispassionate discussion, in an atmosphere governed by the modesty and open mindedness that characterizes the scientific community. The conference will begin on May 1, 2009, with a day of talks by leading experts to an invited audience on the status of economic and financial theory in light of the current situation. Three days of private, focused discussions and workshops will ensue, aimed at addressing complex questions and defining future research agendas for the world that can help address and resolve them. Deep inelastic scattering experiments provided the evidence that the proton and neutron are made up of three more fundamental particles called quarks . One type of experiment in the proton-antiproton colliders produces jets of mesons which correlate with the models of quark confinement. 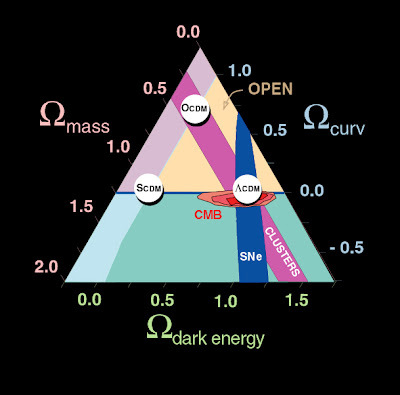 As visualized in the bag model for quark confinement, an individual quark cannot be pulled free because the energy required to do it is much greater than the pair production energy of a quark-antiquark pair. If in a high energy collision, something scatters directly off one of the constituent quarks, it will give it a high energy. With an energy many times the pair production energy, it will create a jet of quark-antiquark pairs (mesons). At times the economy can flow quite easily, while other times, it resists. It is the elastic nature that defines the symbiotic relation of a cultural thinking about what the economy can actually permit, and what of itself, it shall not. This is a "toposense" synesthesically imbued as relevant too, an expression of what can surround the "psychology of society?" What proof do I have that such thinking geometrically induced shall not find itself "in movement" as it is thought about, as well? Dynamically this was lead too. How one can move in straight lines and such, was moved to a new mode of thinking that excels toward a movement in thought. It is done, as if theoretically moved toward a QGP recognition of the dynamical recognition, as if, the theory of strings. Perhaps you may see some familiarities with research material that may insight some correlative recognitions of events as they are portrayed in the science fiction scenario portrayed in the plot? So of course you do your homework first, and then you write about it? The techniques for slowing, cooling and storing cold antiprotons make it possible for ATRAP and its competitors to pursue the production of antihydrogen that is cold enough to trap for precise laser spectroscopy. TRAP got extremely close to cold antihydrogen with our simultaneous confinement of 4.2 K antiprotons and positrons reported in 1999. All the initial cold antiproton experiments were carried out at the CERN Laboratory with antiprotons coming from its Low Energy Antiproton Ring (LEAR), a unique facility that then closed. Antihydrogen experiments in 2000 and beyond will be pursued at the new Antiproton Decelerator ring of CERN which was constructed for this purpose. Using the techniques developed by TRAP, antiprotons will be accumulated within traps rather than in storage rings, thereby reducing the operating expenses to CERN. I finished the book Angel and Demons a couple of days ago. I've had the book for sometime, but just hadn't bothered. I needed a little break from the reporting here so thought to immerse myself in some reading, knowing the movie is out there now. As in any crucial "blackhole calamities reported" some of our science advisers are speaking out to ward off "conspiracy theories" with some factual information, seems to be the jest at allaying fears about what energy released could happen in relation to the plot of the book. High Energy Solar Spectroscopic Imager (RHESSI). 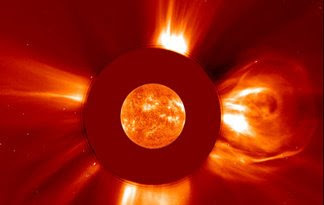 At even higher energies, we find gamma rays produced, not from the flare electrons, but from nuclear interactions of the protons and heavier ions accelerated in the flare. These high energy particles interact with the nuclei of the different elements in the ambient solar atmosphere to produce a far more complicated emission spectrum than the relatively smooth continuum bremsstrahlung spectrum. Many individual gamma-ray lines from a wide variety of different elements in the solar atmosphere have been detected. They result from the decay of such relatively abundant elements as carbon, nitrogen, oxygen, etc. that are excited to high energy states in the various nuclear interactions. The relative intensities of the various lines provide information about the composition of both the accelerated particles and the target nuclei. Furthermore, the lines are Doppler broadened and shifted because of the high velocities of the nuclei as they decay and emit the gamma rays. Consequently, the widths and detailed shapes of the lines can reveal the distribution of velocities of the emitting particles and hence also impose severe constraints on the acceleration mechanism itself. Despite the wealth of information believed to be available from observations of these gamma-ray lines, no gamma-ray spectrometer with the resolution necessary to reveal anything other than the intensities of the strongest lines has ever been flown. It is always the effort to see that such progressions in thought could have transformed any thinking person by the laws and rule of measure that will hold perspective toward the future. These are always being redefined by experiment, and such validations are adjusted then, to what we now use them for. A new way to measure climate? A gravitational perspective held by Grace? 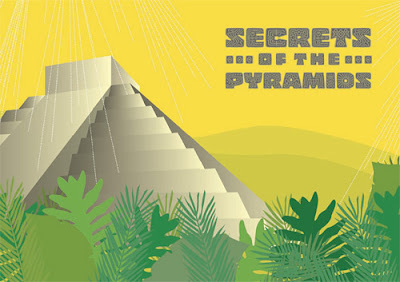 While one may use this knowledge then with an attempt to discover new vaults of "time in measure" and recorded for historical pursuance by civilizations hidden in the pyramids, such efforts revealed nothing. They were not thinking the right way. It is the model developmental aspect which I have demonstrated over and over again that we can conceal the history of memories under such a analogical tool for pathways in the human sphere of perspective? Such dynamical thinking then is the realization that our views had been transformed from straight lines and such to geometric that help us to think dynamically in the world around us. The Friedmann equation which models the expanding universe has a parameter k called the curvature parameter which is indicative of the rate of expansion and whether or not that expansion rate is increasing or decreasing. If k=0 then the density is equal to a critical value at which the universe will expand forever at a decreasing rate. This is often referred to as the Einstein-de Sitter universe in recognition of their work in modeling it. This k=0 condition can be used to express the critical density in terms of the present value of the Hubble parameter. For k>0 the density is high enough that the gravitational attraction will eventually stop the expansion and it will collapse backward to a "big crunch". This kind of universe is described as being a closed universe, or a gravitationally bound universe. For k<0 the universe expands forever, there not being sufficient density for gravitational attraction to stop the expansion. Friedman Equation What is pdensity. If we triangulate Omega, the universe in which we are in, Omegam(mass)+ Omega(a vacuum), what position geometrically, would our universe hold from the coordinates given? If such a progression is understood in the evolution of the geometry raised in non euclidean perspectives, this has in my view raised the stakes on how we perceive the dynamical valuation of a world that we were lead into from GR? Such dynamics then are not just held to what we see of the earth frame but of what we hold in terms of our cosmological recognition of those same dynamics. How much sand then when reductionism has run it's limit that we say how far our perspective has gone into the powers of ten, that we see a limit had been reached? This pursuance did not in the reductionist point of view reduce our apprehension of the world around us but we engaged the world to see that such length contractions are still vital measures for perspective. IN the "mean time," we live in a vary dynamical world. If dark energy or dark matter seemed unrealistic then what measure of that space shall you consider to be, and that it shall not be, in the relationship of "time variable moments?" IN the space of our cosmos we saw a satellite measure say that the expansion is speeding up/slowing down? Does this take away the dynamics of non euclidean geometries to say that this is an abstract version of math of what does not exist? Here L is called the Lagrangian. In simple cases the Lagrangian is equal to the difference between the kinetic energy T and the potential energy V, that is, L = T – V. In this interactive document we will approximate a continuous worldline with a worldline made of straight connected segments. The computer then multiplies the value of (T – V) on each segment by the time lapse t for that segment and adds up the result for all segments, giving us an approximate value for the action S along the entire worldline. Our task is then to move the connected segments of the worldline so that they result in the minimum total value of the action S.
While such a explanation had been served by understanding how one can rescue another and how two different people can get their quicker is the idea that such a plan is possible in the recognition of the cosmos as well. You just had to learn to see inan dynamical way as well. A contour plot of the effective potential (not drawn to scale!). In the above contour plot we see that L4 and L5 correspond to hilltops and L1, L2 and L3 correspond to saddles (i.e. points where the potential is curving up in one direction and down in the other). This suggests that satellites placed at the Lagrange points will have a tendency to wander off (try sitting a marble on top of a watermelon or on top of a real saddle and you get the idea). A detailed analysis (PDF link) confirms our expectations for L1, L2 and L3, but not for L4 and L5. When a satellite parked at L4 or L5 starts to roll off the hill it picks up speed. 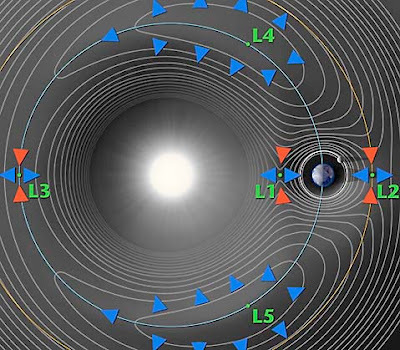 At this point the Coriolis force comes into play - the same force that causes hurricanes to spin up on the earth - and sends the satellite into a stable orbit around the Lagrange point. The geometries as a whole seen in a local region, is the rule of law, as we move outward in space, or how else could we consider the dynamical movement that least resistance can fuel a path traveled with the least amount of energy expended? Can it be said that measure has ever left the mind of those whose age has come and gone, and what appears as "no traces left behind" might indeed be the passage of age of one thought to the next? Progressive? So it is ever the attempt for ingenuity to come forward from the deep recesses of the mind, for daylight to shine, and the measures revealed in as natural setting as possible? Who are these inventors then that help us to begin with one step and move forward with another? Is it their genius that we shall capitalize on, or shall it be the ignited pathways that are set "by ignition," that we say that brain has taken a new course in thinking? Blazing new trails? These "ideas" always existed? But where? 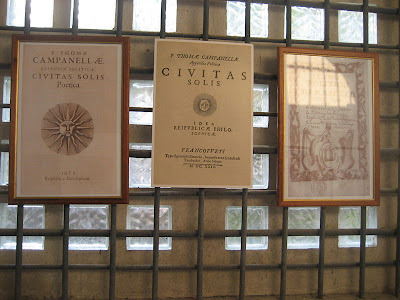 Marcus Vitruvius Pollio (born c. 80–70 BC, died after c. 15 BC) was a Roman writer, architect and engineer (possibly praefectus fabrum during military service or praefect architectus armamentarius of the apparitor status group), active in the 1st century BC. 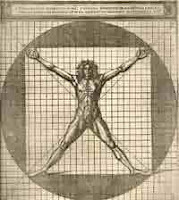 By his own description Vitruvius served as a Ballista (artilleryman), the third class of arms in the military offices. He likely served as chief of the ballista (senior officer of artillery) in charge of doctores ballistarum (artillery experts) and libratores who actually operated the machines. So in today's world what value would Google have to produce a library and recording of all books that exists so that the route to knowledge shall be forever enshrined in some medium that we use now. If all the institutions and architecture of our civilization were to be gone tomorrow, shall such records be readily available to the "searching mind seeking knowledge" if there be survivors, that it will easily dial up the internet, or by wireless, gain access? My job more or less has been to enshrine "such knowledge" in the way we record information, that it is different then what Google seeks to do. Yes, some day by such shadows as again from one of Stefan's earlier link supplied below as "Euclidean Geometry and the Shadows," there will be an alignment with such geometries, which shall point the way to a vault where all things that man has gone through, that one day we will know our true history from the beginning of time till now. This vault to me was about our access to the ideas that exist out there in the ethers and how we might attain by touch of our finger upon it's pulse, that such connection is more then what exists in the Sistine Chapel above, that we had connected to that same resource as Jung's world of the collective unconscious. How so if we did not pursue the very notion of ideas that are attained at "some center" and found connected outside of our self? In 1586 at the age of 22, Galileo (1564-1642) wrote a short treatise entitled La Bilancetta (“The Little Balance”). 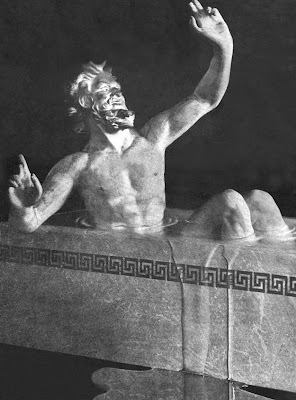 He was skeptical of Vitruvius’s account of how Archimedes determined the fraud in Hiero's crown and in this treatise presented his own theory based on Archimedes’ Law of the Lever and Law of Buoyancy. 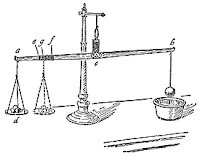 He also included a description of a hydrostatic balance that determined the precise composition of an alloy of two metals. It had not escaped me that the shadows and stories of the cave become fodder for thought, even amongst our own scientists, that they began the process one way philosophically and thought, what is capable in us to see that any dimensional significance would be an higher portal for some movement of the abstract in mind, is realized in topological dance? Reductionism seems to be the ability to measure in powers of ten, and then, we get to a point where everything is all smeared out. So energy at some point becomes the determination of what any particulate could be measured, and yet, we would say that it is like using sand to fill the universe? I have been intrigued by the idea of a "kitchen measure of a teaspoon of sorts" as well as to what water fills any glass to it's brim. Thinking, that such a substance while pertaining to the measure of something, can have space in between, with which it can fill? Yet, it does not flow over? How much before it does, and we say that this measure is what the spirit of these walking bodies shall qualify too? The soul at 21 grams? "Kepler Conjecture is speaking about cannon balls. Tom Hales writes,"Nearly four hundred years ago, Kepler asserted that no packing of congruent spheres can have a density greater than the density of the face-centered cubic packing."